1. Do they pose for you or do you do it from a photo? I’ve tried to say with a straight face that I have a magical ability and can make dogs sit absolutely still for several hours. It doesn’t work. I have to use a photo. 2. I have 2 dogs, so can I give you a photo of each of them and have you put them together in the same painting? Nope. Almost never looks right because the lighting, the distance from the dog to the camera, and the angle at which the camera is tilted are not the same in both photos. So both dogs have to be in the same photo for it to work. 3. What if you do the painting and I don’t like it? I really want you to be happy, you’re my client and I’m a professional. So even if I have to start fresh and re-paint the whole portrait, I’ll do it. I’ve only had to do it twice in the last 15 years, but like I said, I really want my clients to be happy. And if you don’t like the finished product, you don’t pay for it. 4. OK, how do we get started? You send me a photo, I paint the portrait, and when I’m almost finished I send you a picture of what I’ve done for any input or corrections you might want to make. Then I make the corrections and re-send a photo of that to you for final approval. You pay for it when I deliver it to you or when you pick it up, or before I ship it to you. I use FedEx, and yes, there is an extra charge for shipping. 5. 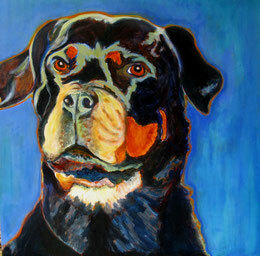 Do you paint other animals besides dogs? Yes, I’ve done a few kitties as well, and I’ll attempt pretty much any kind of animal (or even people, I’ve done several of those) portrait as long as I think I can give you a good result. I use acrylic paint on deep-edged (1.5") gallery-wrapped canvases and I finish the edges to that framing is unnecessary. If you intend to have it framed, let me know ahead of time and I’ll use a thin-edged canvas that’s more frame-friendly. 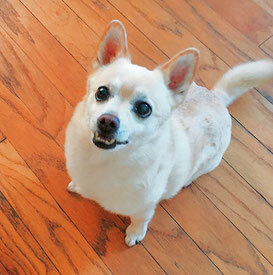 Guido, my dog, hopes sincerely that your questions are answered here!